This course is concerned with the optimum development of the two main muscle masses of the legs, the thighs and the calves. How many times have you seen bodybuilders with tremendous upper bodies but with very little leg development? It seems that the majority of fellows who train with weights think only of impressive upper body development and consequently devote very little attention to their legs. They may feel that the upper body is more important because it is usually displayed more, but they are wrong. The whole body is important. It doesn’t matter how fabulously developed the upper body is – without balanced leg developement it means very little. Fortunately, in my early training, I didn’t make the mistake of not training my legs as so many beginning bodybuilders do. I trained every part of my body, especially my legs. Has it paid off? 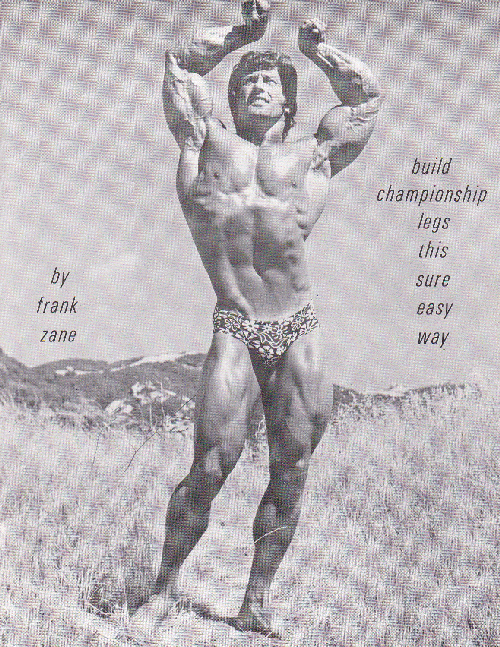 Well, for one thing, I’ve won more awards for “best legs” than any other bodybuilder in IFBB history. Also, since I have so little trouble anymore with the development of my legs, I can spend less time on them and devote it to other areas. Believe me it’s no fun spending hour upon hour doing heavy leg work trying to bring the legs up to the development of the upper body. Such leg training is extremely difficult and can be avoided if you start training legs the proper way from the beginning. In order to develop championship legs, the thighs and calves must not only be well developed, they must also be developed in proportion to each other. I feel that the symmetry and shape of the leg is of much more importance than the size. Hmm… he had superior genetics so getting EXACTLY his chest shape would be hard. But my best guess would be the wide grip neck press with and without incline, Wide dips and incline DB press.